Town Hall: In November, those "Not in Labor Force" rose by a whopping 487,000. If you are not in the labor force, you are not counted as unemployed. Were it not for people dropping out of the labor force, the unemployment rate would be well over 11%. 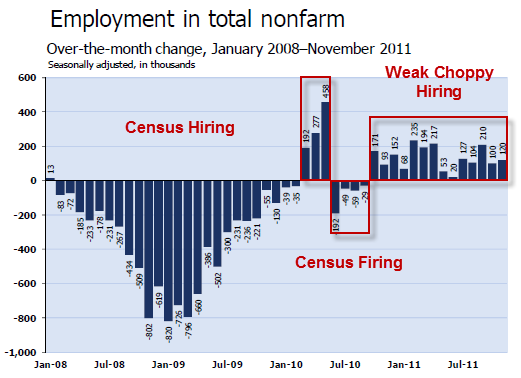 Massive job losses in 08-09 are followed by a quick burst of job gains from census hiring, losses from census firing, and a slow grind in job creation from that point on. This is not a new concept, as each of the recent recessions had taken incrementally longer to get to full employment. Understanding this, the Fed recently announced that the "natural employment" number should be closer to 6-7% unemployment rate rather than 5%, thus lowering the bar to begin raising rates. It will take a while to get to even these higher levels from 8.6%. The problem is that the "backlog" of those who dropped out of the labor force will continue to put upward pressure on the true unemployment rate for years to come. Because the starting point is closer to 11%.